Santa Kang: Our invasion will only triumph if we fool the humans into thinking we are Santa and his wife. Mrs. Kodos Claus: Must I really wear this disguise? The dress is uncomfortable and does NOT flatter my ovipositor. Santa Kang: What is there to flatter? Joking! Please, Kodos, put away the laser blaster. 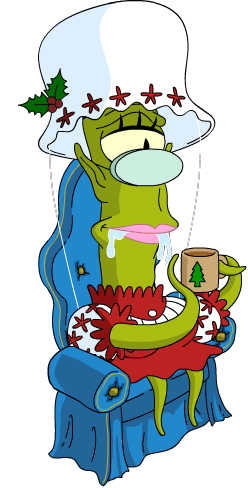 Mrs. Kodos Claus: Relax. I’m going to use it to bake some cookies. And THEN your gluteiods. Mrs. Kodos Claus: My cookies were a giant triumph. Santa Kang: For who, dentists? I broke 3 fangs on them. 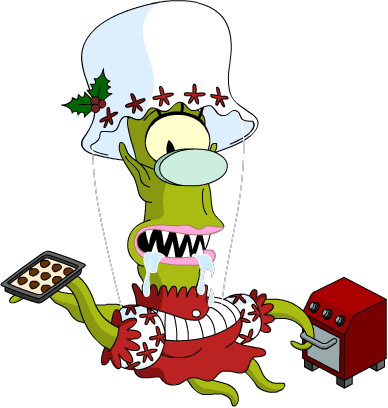 Mrs. Kodos Claus: Fine, I accept defeat in the realm of baking. This homemaking magazine, however, states that cleaning the house is a way to assert your superiority over visitors. I shall assert my superiority! Mrs. Kodos Claus: I tried to clean, but I was unable to master the human technology known as “vacuum cleaner”. In carpet mode it set fire to the carpets and in floor mode it scratched the floor. Santa Kang: You must persevere. You must perfectly imitate a human housewife! Mrs. Kodos Claus: Then I shall start by getting drunk in the afternoon. Mrs. Kodos Claus: Why didn’t I think of this before? I’m pretending to be married to an important businessman — Santa Claus. I’ll just hire a maid and have her do all the work. Santa Kang: Domestic servants?! I’m not made of money. Mrs. Kodos Claus: You won’t be made of anything if you don’t do this. Santa Kang: Kodos, this house looks fantastic. What a wonderful homemaker you’ve become! 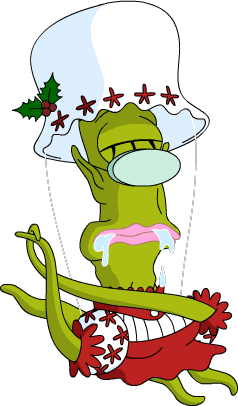 Mrs. Kodos Claus: It’s really all thanks to our new maid, Shauna. You just have to know how to motivate her! I let her and her boyfriend steal from our liquor cabinet. No harm, no foul. Now, let’s celebrate the holidays! I decorated the house festively, with streamers, stars, and human skulls. Santa Kang: Ooh, there’s Shauna’s. Nice. And here are some quick facts about the fireplace…. 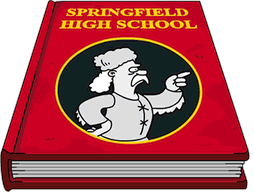 What Does it do: Mrs. Kodos Claus has a task there, otherwise always animated…fire goes. 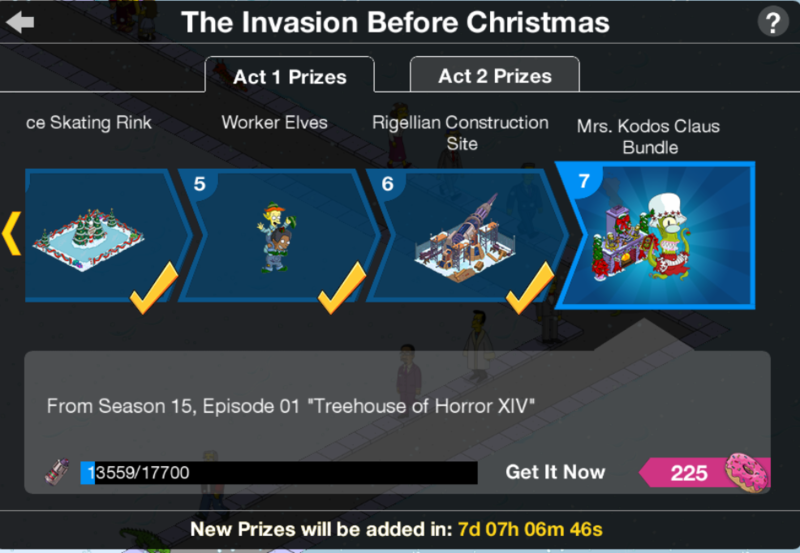 And there you have it, the details behind Mrs. Kodos Claus, the seventh Christmas 2017 prize! Nothing. You’re done until Act 2 starts bright and early tomorrow! 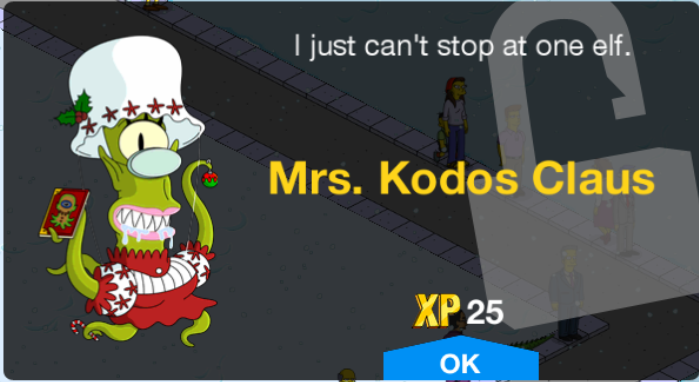 What are your thoughts on Mrs. Kodos Claus? Have you unlocked her yet? Thoughts on her tasks? Sound off in the comments below, you know we love hearing from you! This entry was posted in Characters, Tips and Tricks, Updates and tagged Act 1 Prizes, battery prizes, How do I get Alien to bake cookies, how do I get Mrs. Claus Alien, Mrs. Kodos Claus, Rigellian Christmas, Tapped Out Christmas Event, Tapped Out Kang and Kodos Christmas, Tapped Out Tips and Tricks, The Simpsons Tapped Out, TSTO Addicts, TSTO Alien Invasion Event, TSTO Christmas 2017, TSTO Tips and Tricks, TSTO Winter Event 2017, what does the fire place do. Bookmark the permalink. I really like the look of the Fireplace and didn’t even know it had an income, I wonder what it looks like with the Giant Outdoor Fireplace from a few years ago? As for Mrs. Kodos Claus, I like her outdoor tasks and glad that there is a task at the Fireplace. 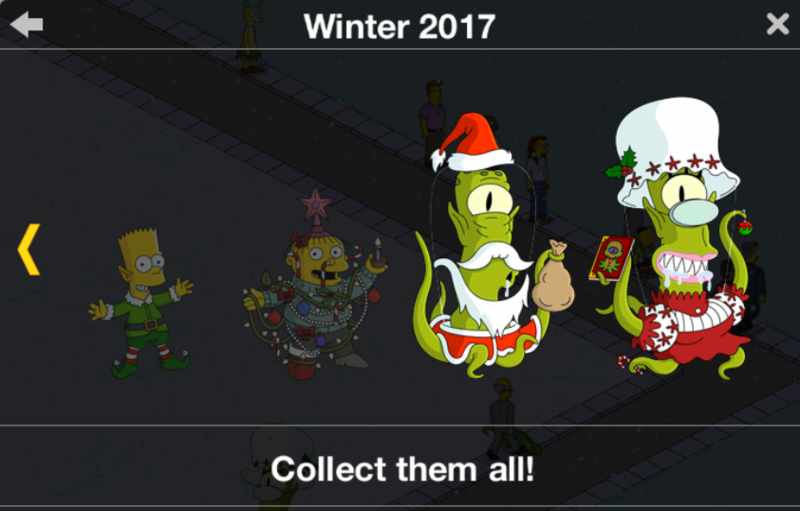 I can’t do any Mrs Claus Christmas tasks because a fairy skin for Kodos is hung in a “flirt with humans” task—unable to change skin. Try going to Krustyland and back…sometimes a “sync” will set things right. Thanks. I actually ended up logging out of both iPhone and iPad devices. Was able to access Kodos skins after that but some items weren’t synced before it logged out (note to self for next time). Appreciate your quick response. This is probably a dumb question, but have you tried storing Kodos and re-placing her into the game? I thought the same thing but the problem was that I couldn’t even select her. I logged out of both of my devices and her profile immediately came up when I signed back in. Was able to deselect her fairy skin and all is right with the world. Thanks for replying. The new flying funzos hover over a character, tap the character. I think the payout is the same, again last tap so need another to be sure. Minor nitpick: the fireplace acts like a building, earning money and xp (300 money & 30 xp / 24h). This is an enjoyable event. I’m so glad it isn’t like last year, I didn’t like it at all! Is it me or is the game just not fun anymore? Every time I start playing the game wants to download 200 updates, which I can’t skip. It’s driving me insane. I have an iPhone SE so that shouldn’t be the issue right? I’ve even deleted the game and reinstalled, but it keeps logging me out and have me confirm my age and it has to update. I’m losing interest fast. I’m on an iPhone SE but still in iOS 10.3.2. I don’t want to update to iOS 11 until the bugs are all worked out…. 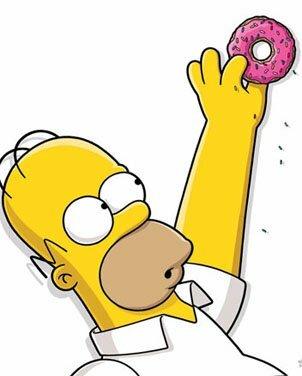 I’ve heard there may be problems with it for TSTO, don’t know if they are resolved. I don’t have any trouble with TSTO but haven’t been able to play Family Guy Quest for Stuff in quite a while. It freezes within a couple of minutes. I quit playing (when it was still working fine) during the alien event on Quest because of isp problems and didn’t try again until the last event. Just tried again for the Christmas event and same problem. Tried all the usual troubleshooting, Quest just doesn’t like me anymore. TSTO runs fine on my iPhone SE and iPad Air 2 on iOS 11.1.2. That’s usually a symptom that you need to free up more space on your device. Try deleting or uploading to the cloud a bunch of photos and any large unused apps, and clear your cache. You may also want to do a complete uninstall/reinstall, too. Thoughts on the animation sitting by the fire? If you turn the small little fireplace just so you can have her sitting in the water. I noticed this with the Manger combo. When he preaches he goes to the front and a rock appears and it’s like he’s standing over the water. Not sure I like the effect but something new I noticed. My fireplace earns 300 every x hours. $300 and 30 XP every 24 hours for me. Can someone tell me if the re-gifting currency I saved since I earned the last prize will still be there when Act 2 starts? I have saved quite a lot and don’t want to lose them. Just checked and it will! Is that a hopeful thought or a knowing hint of things to come, or simply an upbeat way of saying “nada” ??! 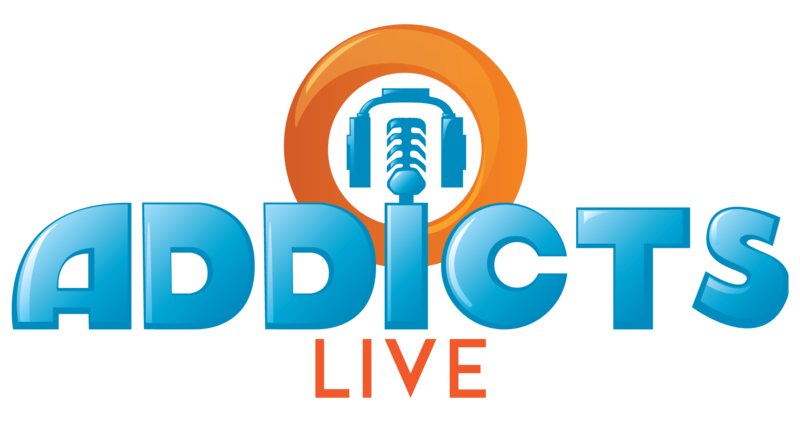 Probably not the right thread, but still want to share my opinion: – this event is superior. One of the best in years. I am happy there is no grinding needed. I like the story and humor. The prize track is just great plus other discounted items are nice. No stress and so much fun for a reasonable amount of time (and donuts). Pure beauty. Loving that more characters are getting skins. Kodos’ fairy costume is one of my favorites so I doubt I will use this one much but I’m enjoying creating a creepy Christmas area in one of my forests.